Editor's Note: Recently, we posted about elementBit's new add-in on the Autodesk App Store, the free Quick View 3D. Sometimes, when we investigate developer or vendor websites under such circumstances, we discover that there are more add-ins available in their stable. This is the case with elementBit, which offers a budget-priced suite of tools. Quick 3D View is a part of elementBit Revit plugin which helps you create a 3D View by Drawing rectangle in plan view, and user will be prompted with a dialog box for Z-value. 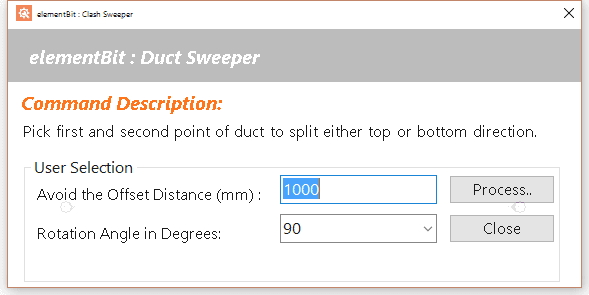 Duct Sweeper is a custom tool developed for Autodesk® Revit® to save time, automotive repetitive task and help you be more productive on a daily basis. 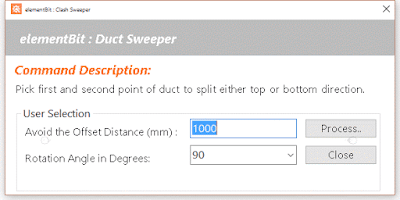 Duct Sweeper: This is very useful command for routing duct, by picking 2 points (first and second) of same duct and user decide the routing should go from top or bottom with additional function of setting rule of either 90 or 45 Degree. Center Selection: This will zoom the selected object. Quick 3D View: Draw box in the plan view, user will be prompted with a dialog box for z-value, concatenating the active user name a 3D view will be created and activated. Open Local Folder: This will open the directory of active project or family. Remove View Template: Toggle Make the active view template to none. The Duct Sweeper lets you quickly and easily create duct routing by simply specifying two points at the same duct. It helps to resolve clashes in the simple, fast and easy way from plan, section and elevation. User can specify the angle either 90 or 45. Parameter name “eBit_PipeLevel” is used to update pipe levels in entire project, which then can be used to schedule pipe level. The elementBit Revit Plugin is brought to you by elementBit. It's priced at 10.00 USD. There's more information available on the elementBit website.